H & M (Hennes & Mauritz AB) a Sweden based company was founded in 1947. The H&M Group has around 2,800 stores in 48 markets including franchise markets. H&M is one of the first and largest fashion companies in the world to make its supplier factory list public. As per H&M "The list includes all our supplier factories with which we have a long term business relation – and thereby around 95% of our order volume for all our brands." 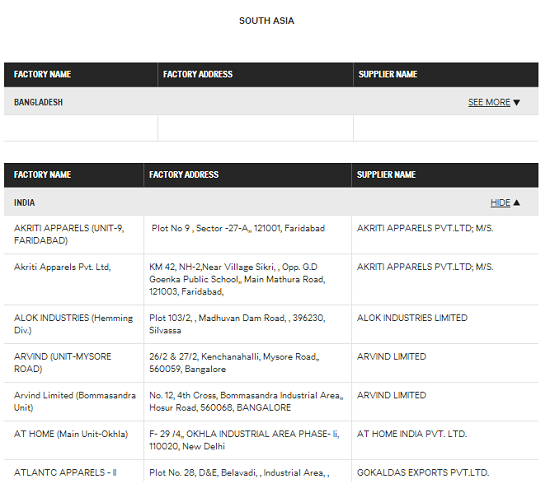 A screenshot of the supplier list is shown in the following. Note: This list has been deleted or moved to somewhere else.